While most transit agencies fares using the Clipper card is to the nearest quarter (BART is to the nearest nickel), one transit agency stands out from the rest to charge Clipper users fares such as $3.32 and $4.04; that agency is Golden Gate Transit. 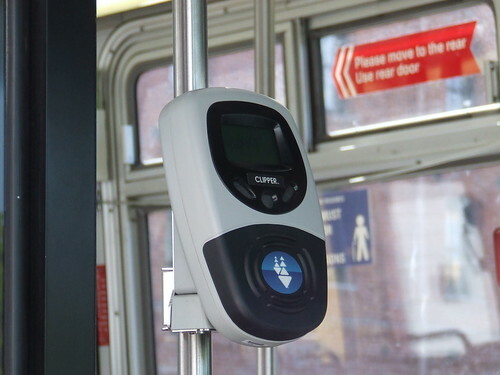 Since Golden Gate Transit eliminated pre-paid ticket books and forced all passengers to use Clipper to receive their discount prices, all passengers gets a 20% discount vs. their cash paying counterparts. It's a great deal for commuters to save, but also a great deal for those casual bus riders needing a little fare break from the high prices for the inter county transit agency. Since their fare table is giving a true discount vs. rounding it to the nearest nickel, you might be wondering, how can I get my Clipper card to be evened-out? The answer is, in-person vendors. Vendors like Walgreens have add value machines that looks exactly like credit card terminals and they are able to input any amount of money you want. I wanted to zero-out my old TransLink card for one last ride on BART, so I added $1.60 to the card and took my last ride to empty the card with no remaining balance. At least I can cheer to the fact that I can now use my brand new Clipper card given to me during the launch press conference. Sorry folks, automated machines can only take bills, and credit cards don't let you put in custom amounts. If you want to be evil by pulling this stunt off (but I don't encourage it): if you have a card with zero value, you could literally ask the in-person vendor to add one cent to the card and get a one cent ride ($1.25 minimum for Caltrain). Since the rules state the card can go into a negative balance of up to $10, it's absolutely possible to use a new card just once to just rip-off the system. Once again, I do not sanction this practice since the MTC may catch on, and they could just go nuts and decide to cancel the negative balance policy. Clipper needs more vendors than just Walgreens. It's fine in places like Fidi where there is a Walgreens every 2 blocks, but out in places like Sunset, the closest one is maybe a mile away. Why don't current Fast Pass sales locations sell Clipper? It all depends if vendors are willing to switch to selling Clipper media. Since Muni won't convert the "A" pass until November, there's still time for vendors to make a choice. Stores want to get the contact to the CA Lottery so they can sell tickets and scratchers. The store owners realize that while they will barely make any money off it, it does attract patronage for people to buy other items like groceries. If you are switching from your old translink card to clipper card just take one LONG last ride, let it go negative, then throw it away! you are too honest man! This won’t work, the minimum you can add at an in-person vendor is $1.00; I tried it once and their machine wouldn’t process it. If it did work I could use my huge stack of zero-value Clipper cards that I scavenge from atop Muni vendors. I did once add $2.01 so that if I ever used it for a Muni ride I would have 1¢ left on it.